Top stylish and simple eat-in kitchen remodeling ideas from Titus Contracting Inc. We know that incorporating a stunning and useful eat-in area is a popular focus of many kitchen remodeling projects. Friends and family love to congregate to share food and conversations in a home’s eat-in kitchen. Casual dining is more of an everyday occurrence than formal dining experiences, meaning that your family will value this kitchen remodeling feature for as long as you live in your home. This article is chuck-full of eat-in kitchen remodeling ideas for you! Convenience is the top reason why most Twin Cities homeowners opt to have eating space in their kitchen. How you live and use your kitchen is a very personal choice. 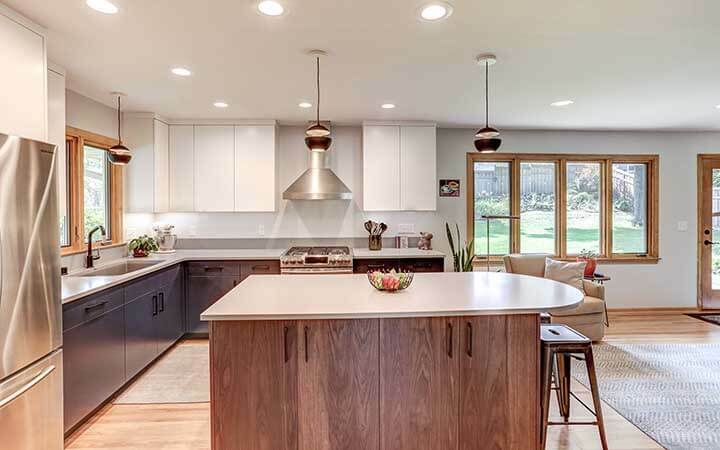 If you are looking for a Twin Cities home remodeling contractor who can provide you with the latest news in kitchen trends and execute your kitchen project seamlessly, read this article. Even adding a small space dedicated to taking meals in the kitchen will be incredibly useful. 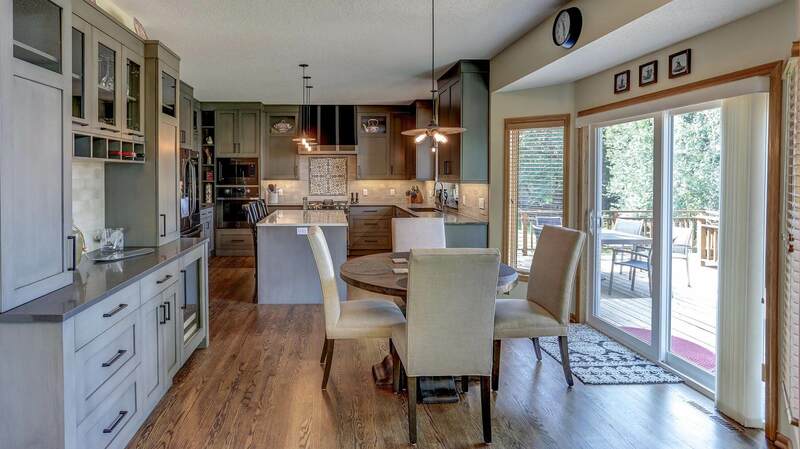 Or you may go with an open floor plan that blends in a casual dining area. These eating spaces work well for the family that is intentional to integrate design, form, and function in their kitchen remodel planning. Eating is a huge chunk of our days with family members at home; you can make it more fun and inviting. Often the kitchen is the one room where the stress of a full house and the constant push of daily schedules make the ability to share a quick meal together of high importance. Titus Contracting will help you work with your existing kitchen to determine the best ways to make your kitchen feel connected and open enough to incorporate an eating-in space. For the cash that you will invest, it is hard to come up with a better value than making your kitchen more livable and lovable. If you have a 4-season encloses porch, consider adding an inviting eating area. Mealtimes can be relaxed and less-hurried if there is less need to shuttle place settings, serving dishes, and food to another room. Today’s busier lifestyles for many families’ means that casual dining is more in line with making life flow easily. After mealtime, cleanup chores are one step easier, too. The renovated Twin Cities kitchen illustrated here mixes in a wine cooler and storage so that your kitchen is used at will and still can look clean and organized. The industrial style pendant lights are ideal for meal preparations and set the mood for open family conversations. The large built-in fridge will accommodate the food and beverages that you want on hand. It is less intrusive, offering more floor space for foot traffic as people come and go for their next nibble. Families that eat meals together are known to feel closer and enjoy home life more. Daily meals don’t necessarily require pulling out the china and setting up your formal dining room. In fact, many homes hardly see action in the dining room. While it is a great place for Thanksgiving meals, having dinner party guests, or to make a family meal more special, remodeling to accommodate an eating area in the kitchen is a top trend. Let’s start with how much space you have, whether you are a gourmet cook, serve food with special diet considerations, or prefer a grab-and-go eating area. A kitchen with a modest amount of square feet may function best with a breakfast bar or center island seating. If your kitchen space is generous, then remodeling and working in an open grandiose dining area will be both functional and stunning. If you have a narrow kitchen, then a peninsula on both sides may work, or extra sitting space along a new bay window may open it up with fresh daylight, too. If you were constructing a new home, you might go for the enormous great rooms that combine hundreds of square feet of living space into singular spaces, punctuated only by the granite or marble outcropping of a kitchen island. This more unstructured, multipurpose space has become the center of many domestic homes where the kitchen, an informal eat-in nook, and formal dining all co-habit. Area rugs, center island placement, columns, and/or pillars can help segment how an expansive kitchen is used and suggest walking pathways for better flow. In practice, open-kitchen planning has long been a quiet struggle between freedom and servitude. The struggle that most have is keeping it tidy when it is so used and exposed. With good planning for storage, it can be assembled perfectly. Scott Rajavuori, the president of Titus Contracting, ensures that your new eat-in kitchen space won’t be awkward, or have a disjointed layout. 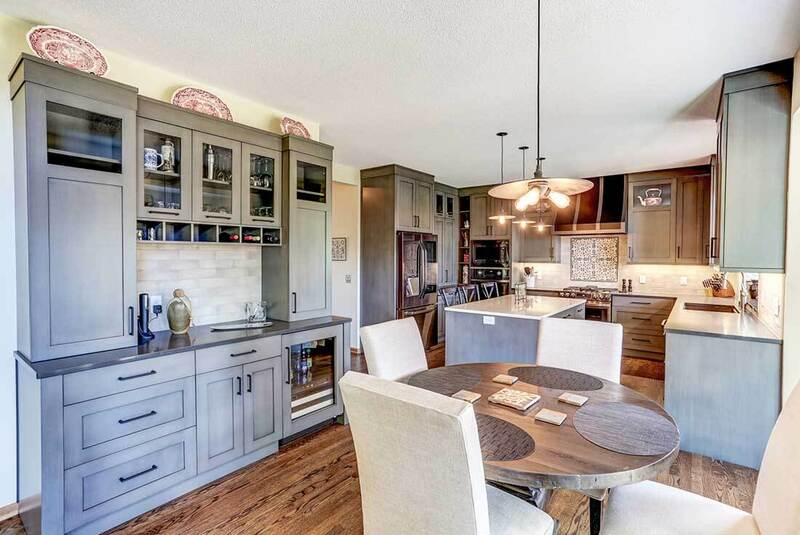 Having completed hundreds of kitchen renovations across the Twin Cities, we can transform your galley style eat-in kitchen from bursting at the seams to a beautiful and function cooking and eating zone. It makes it easy for the chef (mom/dad) to chat with their kids or guests while finishing up meal prep. It means that homeowners don’t need to have their backs to their guests while cooking. It may inspire guests to stay out from underfoot in the kitchen while engaged in the busyness of meal prep. It is one of the most favored forms of convenient seating for serving one-at-a-time foods such as breakfast crepes or socca. It enables everyone to share as much time as possible in the typical family favorite gathering spot. It lets another family member unwind naturally and be close enough for more intimate conversations. Depending on your kitchen’s design, it fits more easily into kitchens of any size than other eat-in areas. When the kids leave for school from home in the morning with their backpacks overflowing with paperwork- it’s great to have a dedicated homework space where you can also set out their boxed school lunch. It doubles as a place to help them stay organized and have oversight when needed. When they arrive home from school, aren’t they always “starving”? Now they can jump on that homework and easily have a snack, too. For individuals who frequently office from home, even if you have a dedicated room for your office, a kitchen desk area helps you overlap tasks when waiting for the oven timer to go off or to complete other meal preparations. Adding a floor-to-ceiling kitchen bay window area opens up the floor space that you may need to welcome new eat-in opportunities to your home life. It also provides a greater sense of openness as the daylight and huge windows create that feeling. Minnesota homeowners especially favor a brighter kitchen during the winter when we encounter less daylight hours. You can opt to hang modern blinds that filter the sunlight when it is most intense or for added privacy after sundown. If you struggle to visualize what this could do for your own kitchen, one of our remodeling project managers can sit down with you and answer all your questions beforehand. Remodeling your kitchen by adding a bay is less extensive than a full kitchen add-on. Which, if your kitchen update needs to be on a budget, wants an energy-efficient kitchen, and has time constraints, this is a way to not go wild with pricey items and still created an incredible eat-in space that your family can grow with. Some kitchen spaces can be enhanced by the room’s architecture turning one corner of the kitchen into a cheery dining area with an L-shaped built-in bench. It can be done to beautifully match your existing cabinetry. The dining nook can be cozy and un-restaurant-like by filling it with a metal bistro table and embellishing the space a sparkly chandelier above. A custom octagonal, marble-topped table accompanied by three chairs and a freestanding banquette provides ample seating in a tight space at one end of the kitchen. A built-in banquette can be more than just a stylish kitchen seating option; you can also use the space under the seat to store small items that you can access when you need them. The type of eating nook can successfully maximize the efficiency and utility of your existing kitchen’s square footage. 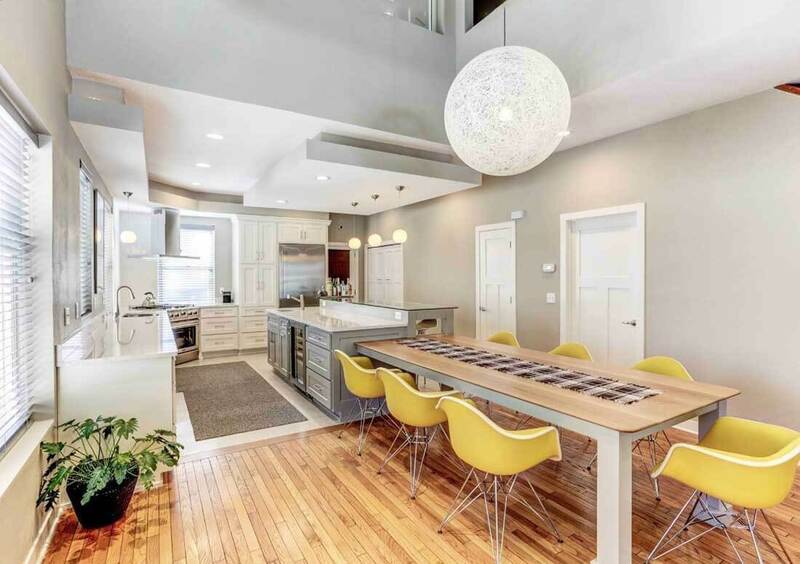 Download tips that will help you prepare for your next Twin Cities kitchen remodeling project. Down load our Stylish and Simple Eat-In Kitchen Remodeling Ideas PDF to share and refer to. Revamping your entire kitchen can change the feel of the whole house. To have your kitchen function better will be a treat every day for every family member. Titus Contracting offers quality kitchen makeovers at value-driven pricing. We cover all kitchen styles and provide free estimates. We are locally owned and operated and have an “A+” rating with the BBB. We can help you keep your next kitchen remodel both stylish and simple. We’ll help you achieve a kitchen that is both aesthetic and practical. 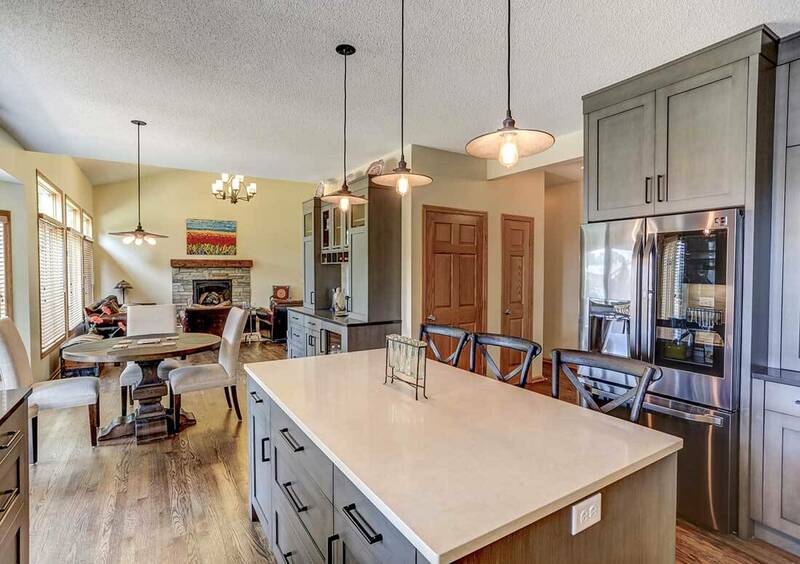 Using your local Twin Cities kitchen contractor, Titus Contracting LLC., can help make your dream kitchen a reality with many kitchen design options. View our kitchen gallery to see revamped kitchens.